Provides a 2' - 5' fall height. Provides a 6' - 8' fall height. 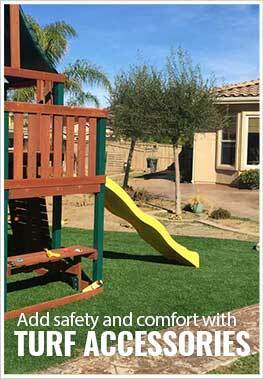 Description - Our PlayTime Turf Rolls are the perfect playground turf for any home play or swing set. These turf rolls come with and without padding and are very easy to maintain. Constructed with durability in mind these turf rolls will provide a soft and comfortable area for children of all ages to play on. The padded version of this artificial grass roll is not fall-height-rated but is more for comfort. These rolls can be used for commercial use and can be made fall height rated. To get a fall height rating for these fake grass rolls, we recommend installing these turf rolls with our Lawn Pad, Play Pad 5, or Play Pad 8. A 15-year warranty backs our PlayTime Turf Rolls. Weight – The non-padded version weighs .634 Lbs. per square feet and the padded version weighs .696 Lbs. per square feet. Recommended Uses – Our PlayTime Turf Rolls are perfect for any backyard playground and are also commonly used as turf for pet areas, under swing sets, as turf for public playgrounds, and much more. Padded version adds comfort underfoot, but is not fall height rated. Add our Lawn Pad, Play Pad 5, or Play Pad 8 to get a proper fall height rating.